We had houseguests this weekend. Perfect houseguests. I have known Catherine and Jerry since we were in our very early careers. When we were in our 20s and early 30s. When we wore clothes with very large Joan Collins padded shoulders (!!) We lost touch, then reconnected a few years back, and fell right back into a comfortable friendship. We made hummus from the book and it was alright. A little thick. 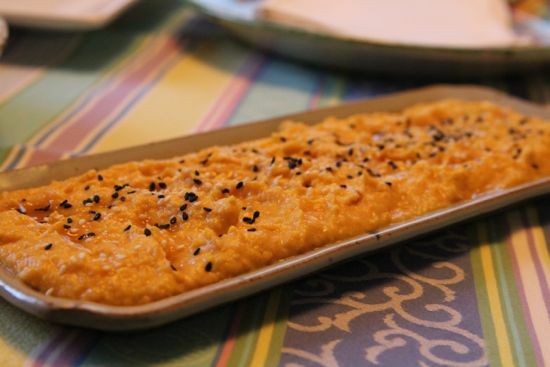 It calls for a great deal of tahini, and maybe that’s the hummus that is served in Jerusalem? I will use the chick pea cooking technique, using baking soda to release the skins, but far less tahini, the next time. Here’s the labneh from Jerusalem, a combination of cow and goat’s milk yogurts, which is fantastic. Plated it per Rivka’s instructions. We made a roasted butternut squash and tahini puree, finished with date syrup. I loved this dish. Catherine thought it might make a great soup, thinned with broth. 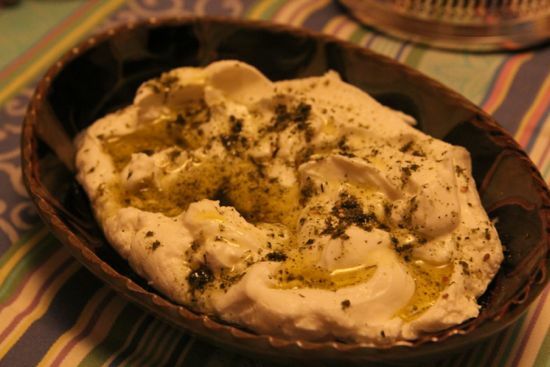 I can see that, but I liked it with warm pita, and as a third dip, with the labneh and the hummus. This will be an awesome lunch food this week. There were two salads. 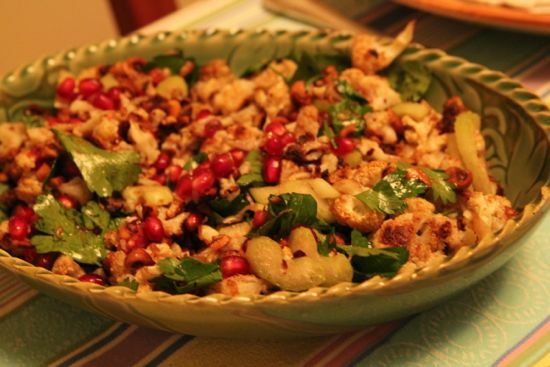 Incredibly textured, bright and thrilling, the roasted cauliflower, hazelnut and parsley salad was visually appealing with the sparkly pomegranate seeds. Fattoush is my new BFF. It’s refreshing, tart, and crunchy. Just what I’m looking for in post-holiday eating. I will be making it again and again. It’s a panzanella of a different culture, which has me wondering what other bread-ish salads there might be out there. 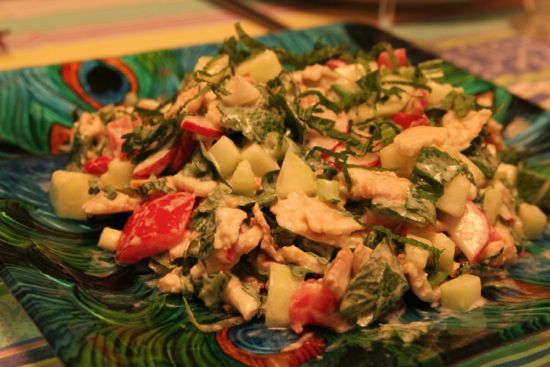 Carol’s blog, In Medias Recipe was the first to highlight this salad. Highly recommend! 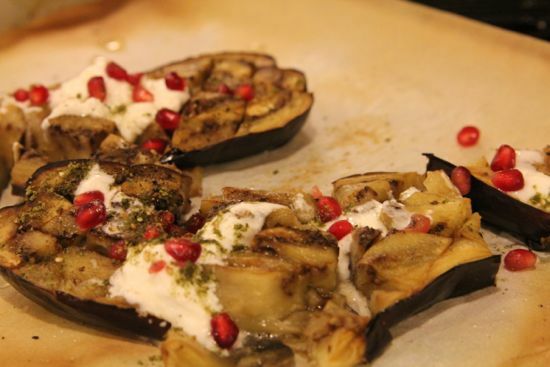 The eggplant from Plenty (also Ottolenghi) made an appearance, as it’s just so darn good. As did my homemade merguez (from the freezer!) 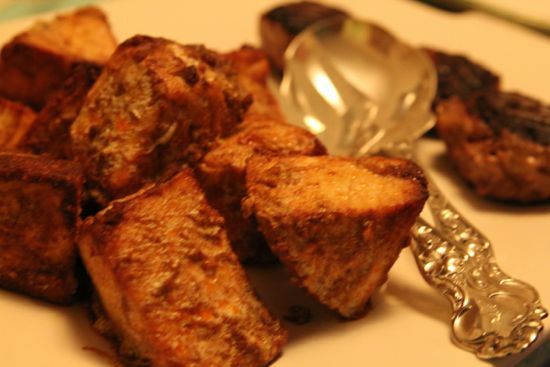 And this gorgeous recipe for halibut was reimagined with swordfish, cut into big chunks and roasted in a very hot oven. 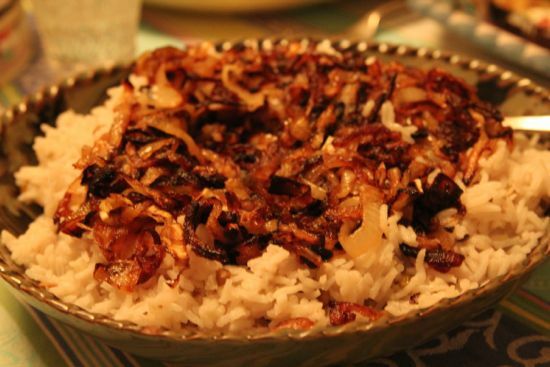 The favorite dish was the lowly mujaddara, a peasant dish if ever there was one. Lentils, rice, onions and spices, the onions take the dish to over the top tasty. It was a feast, with warm pita, crisp California Sauvignon Blanc and a ripe Spanish red. Dessert (Muttabaq) was fantastic last night, and again today (for breakfast, at tea time, and dessert!) 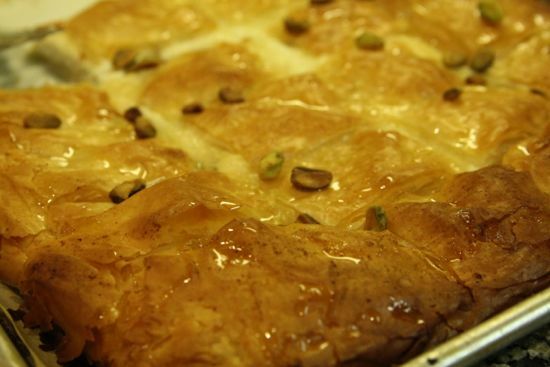 Goat cheese and fresh ricotta filled phyllo dough, hot from the oven, it gets sprinkled with lemon syrup. If you are more of a cheese person, this dessert is going to thrill you. 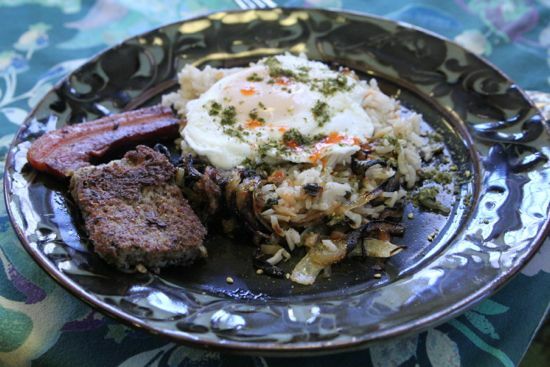 And then, for breakfast, to gild the lily, we put a poached egg, hot sauce, and more onions on the leftover mujaddara. Happy happy happy meal. So, seriously. Buy this book and cook from it. Wonderful post, Cathy! And, I would imagine, an amazing evening, too. We’ve been searching the web for people who have been inspired by the cookbook. Nice! Beautiful pics. Date Lady, so glad you commented on Mrs. Wheelbarrow’s terrific post. A dear friend @omgyummy and I are launching a virtual cooking group based on the Jerusalem cookbook. We have a FB page called Tasting Jerusalem, and on Twitter you can find us at #TastingJrslm. Please join the fun! We loved the butternut squash-tahini spread but I thought it was a bit tahini-heavy, too. Still, we’re excited about working our way through both books. I can’t imagine a better way to spend time with friends, or truly discover a new cookbook, than to all pitch in and prepare a feast together. I gave this book to my dad for Christmas and the next time I’m home, I think I’ll propose that we make a meal from it. Had the same idea this weekend with Plenty recipes. So colorful. I had 4 huge pommagranites to use up. And, coincidentally, I just saw something about mujaddara on a TV news show. To spice it up further, toppings of hot sauce, crispy fried onions, and chickpeas, among others were added. 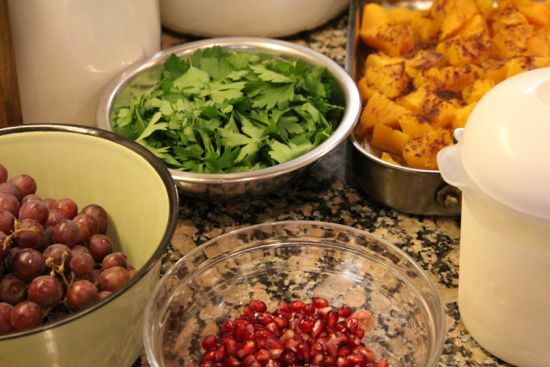 “Jerusalem” is the Cookbook of the Month on Chowhound’s Home Cooking board. Take a look! Happy New Year Cathy! Thanks for sharing this cooking extravaganza! I was just tweeting with Gail and Carol yesterday that it would be my ultimate blogger event to be able to cook with all of you together in one giant kitchen. I am going to post this triumph of cooking on our new Tasting Jerusalem page. I love how the most peasanty dish was the favorite. Happy cooking in 2013. I’m so behind on my blog reading but finally catching up – first, this feast looks delicious. Second, I’m so glad you liked my recipes – those are two of my favorites. Hope Mexico is fantastic – can’t wait to hear the full report. 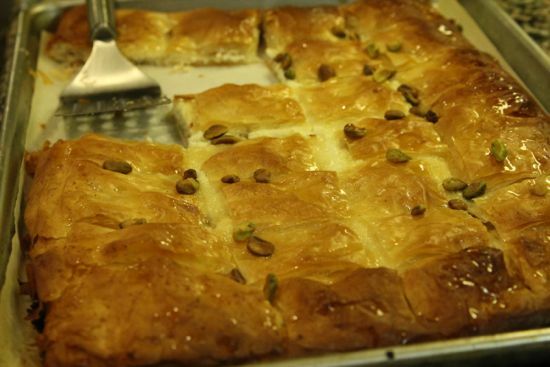 I made that mujaddara this week–amazing! I am smitten with this cookbook. Thank you for the recipe reviews, since it’s hard to know where to start when everything looks so good! The fattoush and the butternut and tahini puree are definitely going on my list. And since one good turn deserves another, I’ll let you know that I also LOVE the roasted butternut squash with tahini and za’atar from Jerusalem, we’ve been making it over and over. The butternut squash and tahini recipe sound great. I plan on making it within the week.